Start e-filing at Mytaxcafe.com and enter your required details. Ensure that the Bank number and related information are correct. 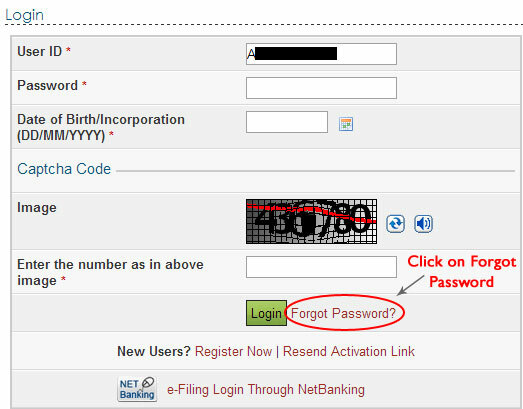 After you have e-filed your return, login to www.incometaxindiaefiling.gov.in and click Forgot password. This opens up a window to know the PAN. Enter your PAN as your User ID. Select the mode through which you want to reset the password. Select 'Using OTP (PINs)' and opt for receiving OTP through 'New Email ID and Mobile Number'. You will receive an OTP in your new email ID and phone number. Enter these OTP in the area provided in Income Tax site and click on 'Validate'. Enter your new password, twice and click OK. Your password is successfully reset. Login to the income tax website and click Forgot Password. Enter your PAN as user id and Captcha code as given and click continue. Select an option from the drop-down list through which you can reset the password. Option 1 : Answering a secret question - At the time of creating your account, there were few secret questions asked in order to recover your password at the time you forget it. If you remember the answer to your secret question, select this option. Enter your date of birth, select Secret Question and enter Secret Answer. If the details match with the records of Income Tax, you will be prompted to enter a new password. You can now login to the income tax website with your new password. Option 2 : Upload digital signature - You can reset income tax password by uploading your digital signature. In case you don’t have it, buy the Digital Signature and upload it. When you upload your digital signature, the Income Tax Department website authenticates the particulars such as PAN, Name, Date of Birth, etc. and if the details match, the password is reset. Option 3 : Through One Time Password (OTP) - You can reset your password by using OTP facility. On use of this option, you choose to receive PINs on your Email ID and on your phone via SMS. Further, you can either receive PINs on your registered email and phone or on new ID and number depending on your choice. In case you go for Registered Email ID and Phone, your id and number will automatically appear on the window in an encrypted form. On clicking on 'Validate', you will receive a mail on your Email ID from the Income Tax Department providing you an OTP. Along with the email you will also receive a PIN on your mobile number. Enter both the PIN on the Income tax site as asked. Finally, you can enter your new password. The other way is to go for 'New Email ID and Mobile Number.' Because you are providing a new id and number, you will be required to provide certain other information along with. This is required just to ensure that no unauthorized person is using your Income Tax profile. However, you are given few options among which you can opt to give information of your choice. OLTAS CIN - In this case, you need to provide BSR code, Challan date and Challan number (CIN) as available in Form 26AS. 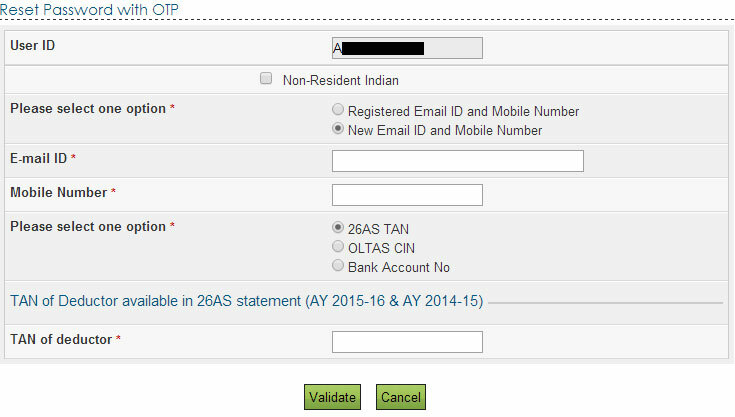 Bank Account Number - On opting this, you have to enter the bank account number as mentioned in Income tax return. In case you have not filed your Income Tax return yet, you can file it through Mytaxcafe.com. After providing the required information click on 'Validate', if the information provided by you is correct as per Income tax record, you will receive PINs on your New Email ID and mobile number. Enter these PINs to reset your password. In case you do not receive OTPs in a reasonable time, opt for 'Resend PINs'. Option 4 : Net Banking account - You can reset the password by using your Internet banking. Select the Net banking option given on the screen. You will be required to select the name of the bank and you will be redirected to your bank’s website. After you login to your Net banking account, locate and click Login To The I-T E-Filing Account to directly login to the Income tax department’s e-filing website without any password. Since you have logged in to your account of Income Tax department, you can reset the password by clicking Profile Settings. Make sure that all the above details should match with the records of Income Tax department. If any one of the details differs, you will not get a reply from the Income Tax department. If all the details correspond with the records of Income Tax department, you will definitely get a response from the Income Tax department within 48 hours containing the password reset link. Even if you don’t receive any email within the prescribed time limit, you can call 0124-2438000 to reach the Customer Care. You can briefly explain the background work that you have performed so far and also quote that you haven’t got a response even after 48 hours and nothing has happened. The Customer Care Executive will supply a default password which is active after 2-3 working days. Once you login with the default password, you can now change the password. Efile Income Tax Return at mytaxcafe.com without any Income tax site password! Forgot Income Tax Site Password?